UFW Stories: "Que Viva La Cuasa!" He was a small unassuming man with dark hair and a swarthy complexion. I was just a teenager and did not know everything about him, but I knew my Dad was involved and I knew it was important. I led a privileged life, but my Dad was an “activist” as the pundits of the day would describe him. His involvement in the “movements” (Civil Rights, Vietnam, The United Farm Workers) had drawn me in as well. Living in a household where your Dad went to Selma, Alabama to march with Dr. King, and watching protesters burn draft cards with Joan Baez was life as usual, made my childhood a bit unusual. I knew a “special guest” was coming for dinner, but this could mean almost anything. A radical priest shunned by his church, a famous author, or a street bum he had befriended, we never knew what to expect and tonight was no different. I arrived home to find the man chatting with my father and was quickly drawn into the conversation. “The big farmers don’t care, it’s all about the profits while my people suffer and starve. A living wage is all we ask” he said. My Dad who grew up in the Central Valley could relate, but I, who grew up in Palo Alto (not yet named the Silicon Valley), struggled to understand. I don’t remember everything we talked about, but I do remember it moved me deeply. I was young, and this man was not yet a household word, but together we knew we just might change the world. All this was forgotten for forty-seven years until a message from my Dads second wife arrived. “I’m cleaning out the garage and I’ve got something I believe was yours.” My Dad had passed away years ago and Barbara had kept some of his things. A package arrived a few days later with the long lost record album. 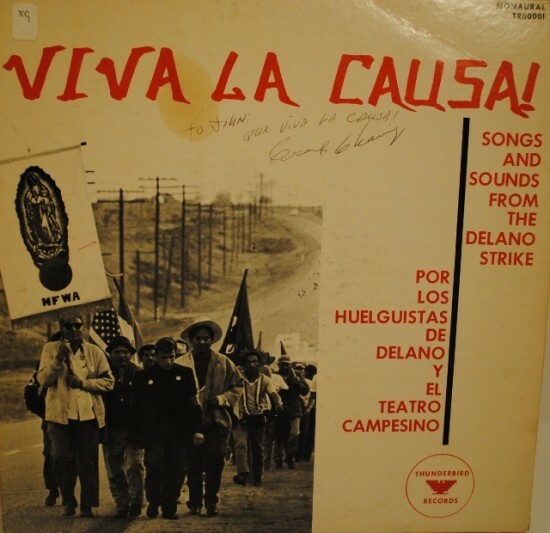 The inscription on the cover said simply ”To John-Que Viva La Causa!” and was signed “Cesar Chavez”.